We can’t be absolutely certain (church records for Shakespeare’s baptism and funeral have been extrapolated to give the 23rd as the likely date for both his birth and death), but it seems somehow fitting for the man who almost singlehandedly made tragicomedy a workable concept—who could, for example, put some of the most mordantly funny lines in the English language into a play (Hamlet) that is concerned with the question of whether life is meaningless and mere existence unbearable—that his birth and death should be commemorated on the same day. Doubles and doubling of one sort or another are everywhere in Shakespeare. I think he would have appreciated the aptness of this mirrior image beginning-ending to his life. 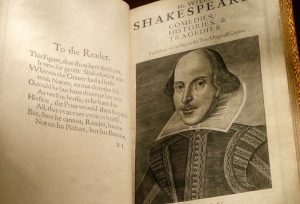 Sophie loved Shakespeare above all other writers, and it was his capacity for multivalence, she said—multivalence in language, in intellectual complexity, in genre, in characterisation, in emotional range—that gave his work such power and dynamic resonance. Life is complicated. Joy and sorrow are both love’s children. Grief is a living testament to that profound but painful fact.